Ireland West Airport is delighted to announce that Croí, the Heart & Stroke Charity, Hope House and The Jack and Jill Foundation have been selected by airport staff as its charity partners for 2019. 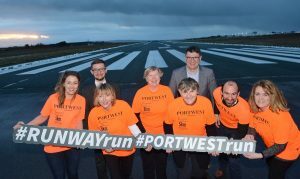 Join us for the Ireland West Airport annual 5k runway fun run sponsored by Portwest, which will take place on the runway at Ireland West Airport on Saturday March 30th at 5pm. Runners and walkers will take-off down the runway at 5pm and complete a 5km course with a difference. All are welcome to attend what promises to be fantastic evening for all the family, raising much needed funds for three charities (including Croí) in 2019.